Col. Sandra Karsten will take over on Sept. 1 as director of the Mo. Dept. of Public Safety. Gov. Mike Parson has removed the interim tag from Sandra Karsten’s job title as director of the Department of Public Safety. 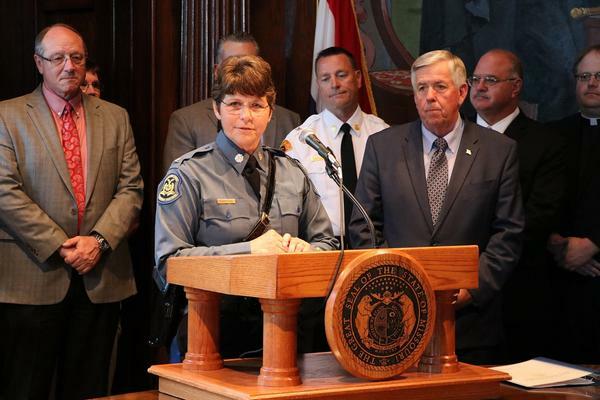 Last week, the superintendent of the Missouri State Highway Patrol was named interim director of the safety department when the governor announced he was parting ways with Drew Juden, who was appointed last year by former Gov. Eric Greitens. Shortly after being named interim director, Col. Karsten announced she would retire from the state patrol on Sept. 1. Parson told reporters Monday that Karsten will be “an incredible addition” to his cabinet when it comes to dealing with Missouri’s crime rate. Although Karsten will take over as public safety director on Saturday, she will still have to undergo Senate confirmation next year. She takes over an agency that oversees the Highway Patrol along with the Missouri National Guard, the State Emergency Management Agency, the Divison of Fire Safety, the Division of Alcohol and Tobacco Control, the Missouri Capitol Police, the Missouri Gaming Commission, and the Missouri Veterans Commission. Parson added that Karsten will take a leading role in helping combat gun violence in St. Louis and Kansas City. Karsten joined the Highway Patrol in Sept. 1985 and began work as a road trooper in Callaway and Audrain counties. In 1996, she was assigned to the Field Operations Bureau at the patrol’s headquarters in Jefferson City and later served as human resources director and commander of the administration-services bureau. She joined the command staff in 2012 and last year took over command of the entire patrol when she was named superintendent by Greitens and later confirmed by the Missouri Senate. She was the first female commander of the patrol and will also become the first woman to head the Department of Public Safety.